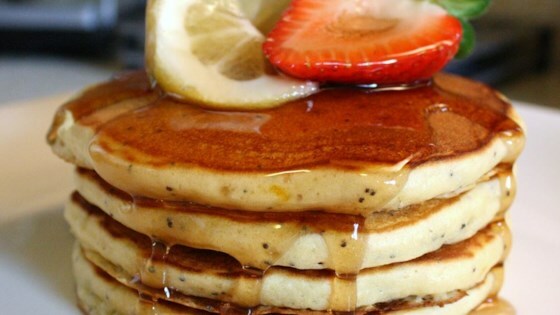 "I love lemon poppy seed muffins and who doesn't love pancakes? So I brought the flavors together in this fluffy pancake recipe one lazy Sunday morning, and we loved them. It's quick to make and adds a little something extra to our weekend breakfasts. I hope you enjoy them on YOUR lazy Sunday morning." I made these with whole wheat flour, and 1T honey instead of sugar. Great recipe for light and fluffy pancakes! They weren't lemony enough for my taste. A very good pancake for Monday morning breakfast treat with a little bit of wildberry jam it is terrific.